YWCA Bucks County - Times Publishing Newspapers, Inc. Imagine a community of empowered women, girls and families reaching their full potential through increased opportunities, education and supportive services. YWCA Bucks County is a nonprofit organization serving women, girls and families since 1954. We are on a mission to eliminate racism, empower women, stand up for social justice, help families and strengthen communities. Across the USA, there are 225 associations that serve more than two million women, girls, and their families. Annually, the YWCA empowers over 2,000 women, girls and families in Bucks County with programs designed to inspire women and girls to reach their full potential. Diversity and inclusion is an important part of our organizational culture and a prominent component of everything we do. Programs include structured support groups for women and girls, rapid re-housing, parenting education, workforce development, financial literacy, family support and stability programs, and community dialogue around gender and racial equity. You can help to increase opportunities for women and girls to explore leadership, self-confidence, gender identity, healthy living, parenting knowledge and increase women, familial self-sufficiency, and financial independence by supporting the YWCA Bucks County. *Barnes and Noble Book Fair – Reading to Racism – February 23rd, 2019 – Join YWCA staff and community members at the Barnes and Noble, Neshaminy Mall from noon-3:00pm for an afternoon of activities promoting diversity, inclusion and celebration of cultures through our Reading to End Racism program. *Salute to Women Who Make A Difference – May 16th, 2019 – The Salute to Women Who Make a Difference is a hallmark event of the YWCA that proudly honors female leaders who live, work or volunteer in Bucks County. Each year, the YWCA Salute to Women recognizes women in Bucks County making exceptional contributions to their businesses, organizations, and their communities. *Stand Against Racism – April 25th – 28th, 2019 – The Stand Against Racism is a national initiative of the YWCA USA. Locally, the YWCA Bucks County joins over 750 sites nationwide to advocate and lead activities that deliver a clear message that we are on a mission to eliminate racism. This event is an amazing opportunity that allows our community to demonstrate our commitment to diversity, equality, safety and inclusion. 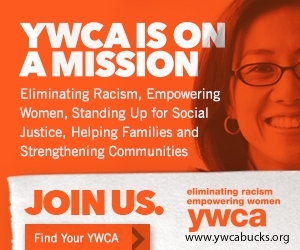 We invite all of you to join the YWCA as we take a Stand Against Racism. For more information on how you can get involved visit our website at ywcabucks.org, or contact Kristin Chapin at 215-953-7793 x112 or kchapin@ywcabucks.org.